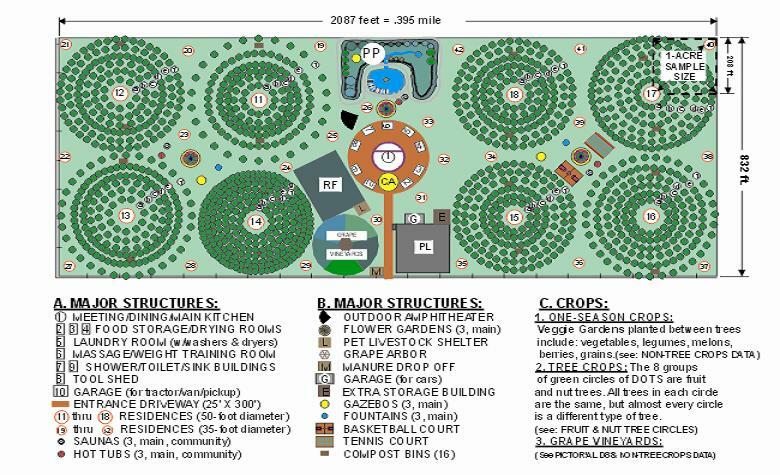 The picture below is a LANDSCAPE DESIGN for a community of people to grow all their own organic, vegetarian & fruitarian food. The CIRCLES of GREEN DOTS in the picture are groups of fruit and nut trees. Each circle of trees is a different type of tree and is identified with a letter shown in the link to the left of the picture called: FRUIT & NUT TREE TABLES. For a complete explanation of this pictorial, go to the first link, the Description of Sample Parcel D1. Use the links to the left of the picture to quickly find specific information. Enjoy, keep an open mind, let your creativity flow, and may you be inspired to create your own community!